The BCCI declared Bhuvneshwar Kumar fit and said he will be a part of India A squad in the ongoing Quadrangular series. Bhuvneshwar Kumar had aggravated his lower back injury while playing the third India-England ODI match in the England. He had to undergo recovery training at the National Cricket Academy. 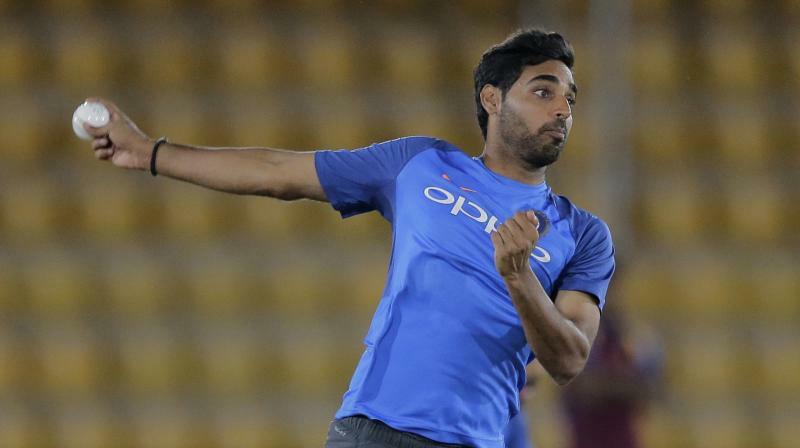 The pacer Bhuvneshwar Kumar, additional two weeks to recover fully, which ended that Kumar could not appear in the Ndahas Trophy and one off Test against Afghanistan. the Indian team has also missed out on the services of fast bowler Jaspreet Bumrah,, who was out due to a thumb injury. Bhuvneshwar Kumar will play against the South Africa A on August 29 here as Shreyas Iyer led India A will battle it out for the third position in the Quadrangular series. The selector announced 18th man squad for th fourth and final tests on August 22. Bhuvneshwar Kumar omission form the squad has surprised many but his return to fitness might receive his chance of getting a call up. Shreyas Iyer (captain), Hanuma Vihari, Nitish Rana, Sanju Samson, Mayank Markande, Krishnappa Gowtham, Krunal Pandya, Deepak Chahar, Mohammed Siraj, Shivam Mavi, K Khaleel Ahmed, Ambati Rayudu,Prithvi Shaw, Ravikumar Samarth, Suryakumar Yadav.